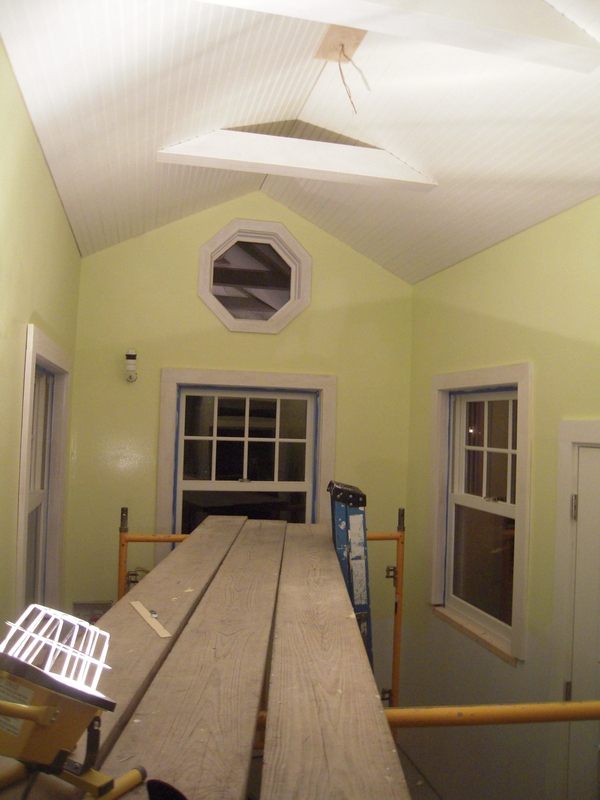 So we’re now stuck with some blazing yellow green – ‘Lemon Pie’ wall paint as Meghan calls it. 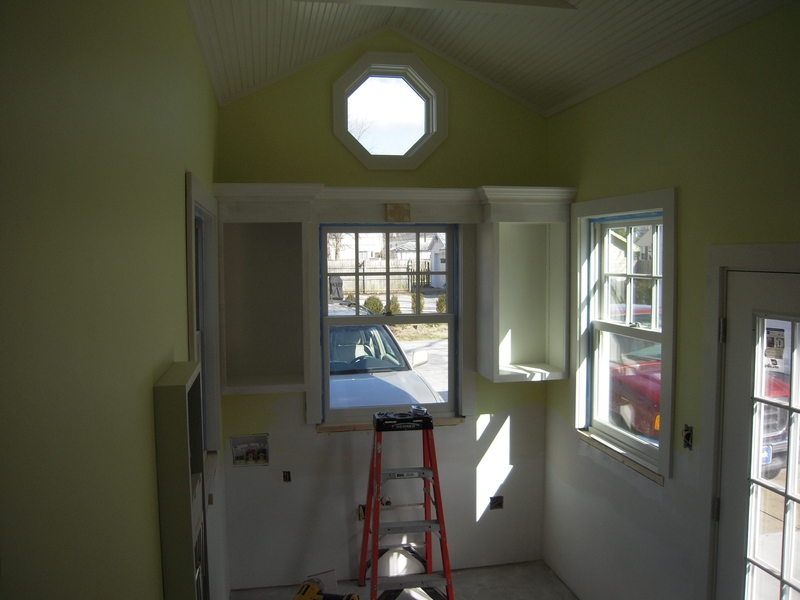 I gotta cover some of this stuff up or I’ll be blinded by the sunlight coming through all those windows. This is the SW Springtime. I’ll be able to tone it down a little – trust me. 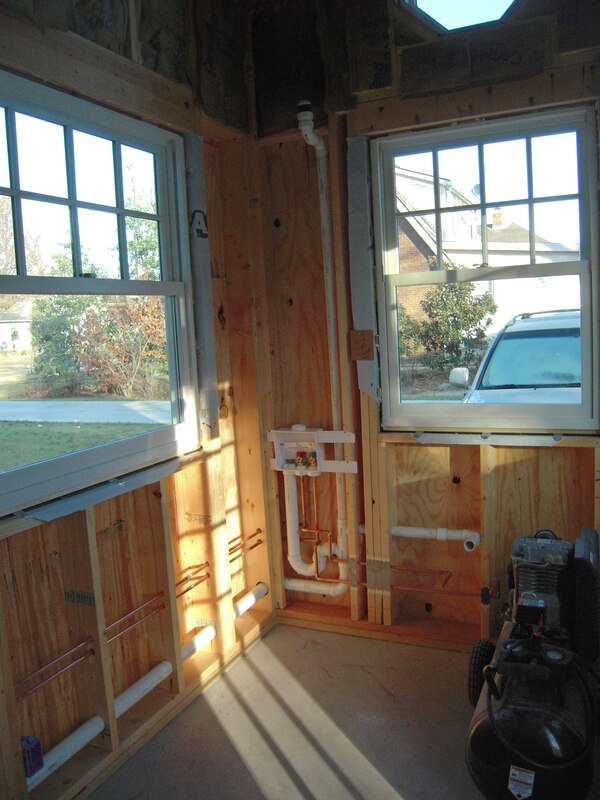 The little gizmo just to the left and above the center window is a mechanical vent for the plumbing. 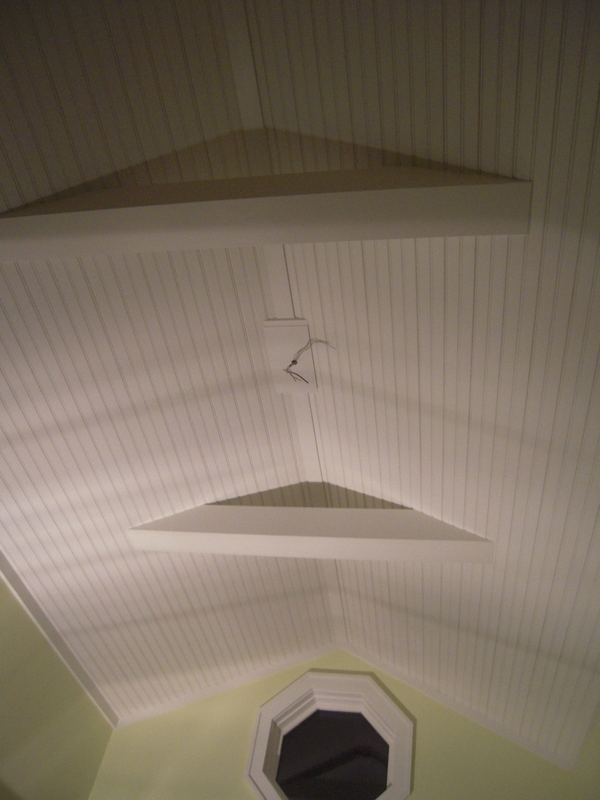 I didn’t want to run a vent stack through the roof, or find a way to get it there with the vaulted ceiling. So, I’ll have to make something to hide this little eyesore. 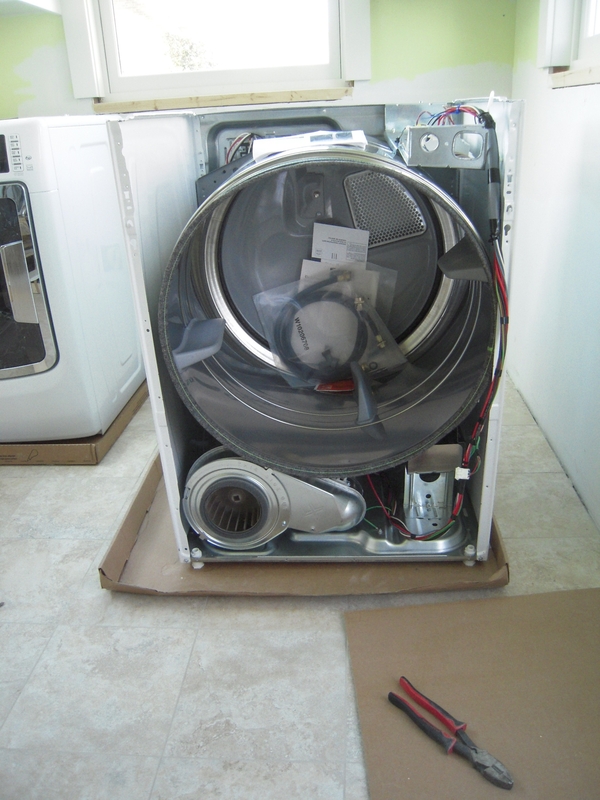 It has to be open and accessible in case it needs to be serviced or replaced. 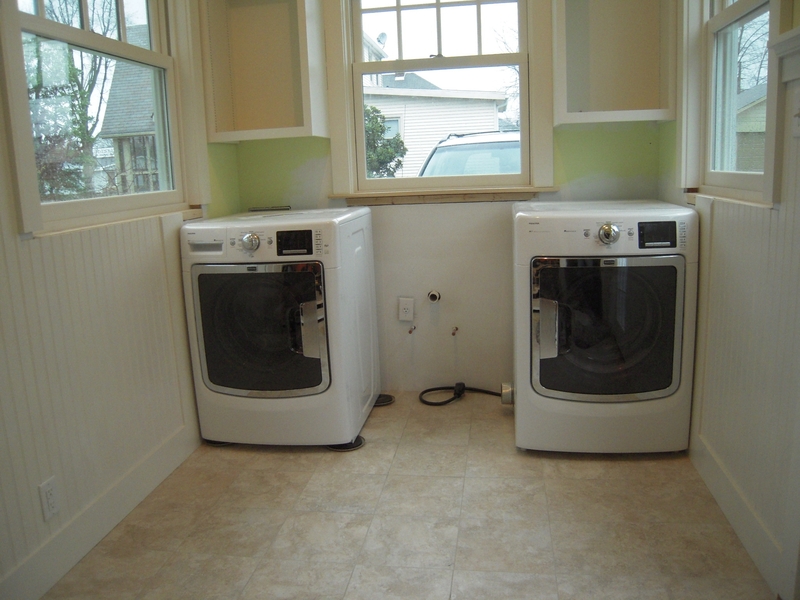 Here you can see the boxes for two cabinets. As usual, I just put something up and see if it sticks works. 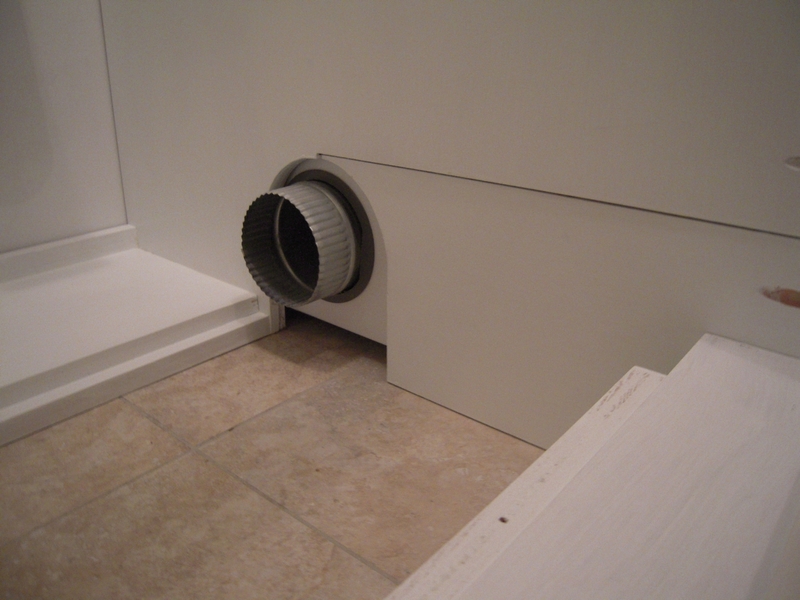 This is the first step to hide that vent. 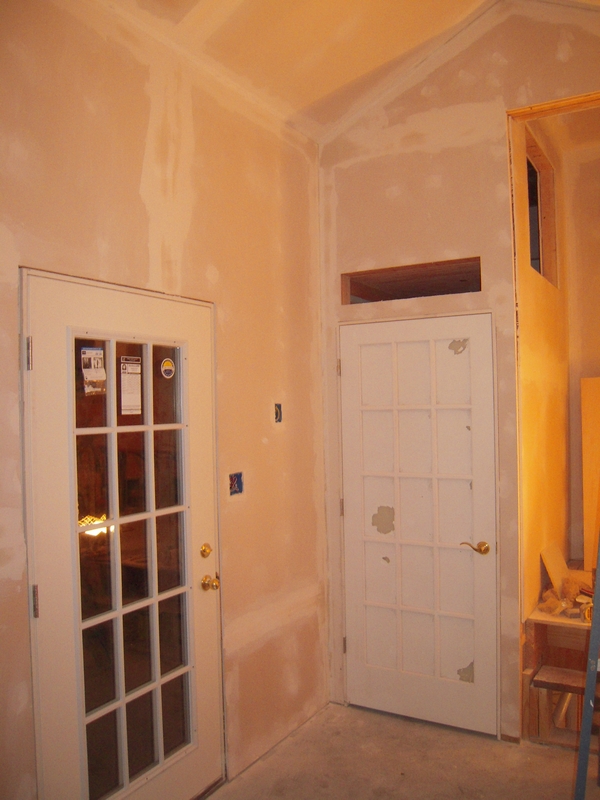 Also, you may have noticed the new stripe of drywall that’s missing. Well, I decided it would be hard for my tiny wife Francia to lean over the counter (imaginary for now) and turn off the sink light. So I moved it over to the door wall. Another freestyle design faux pas. 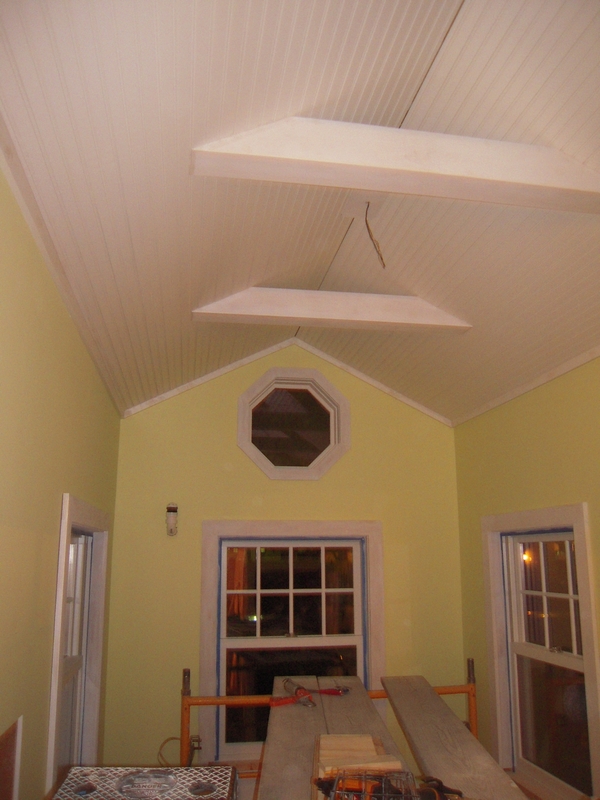 I’ve got the ceiling trim details worked out on the bead board ceiling. 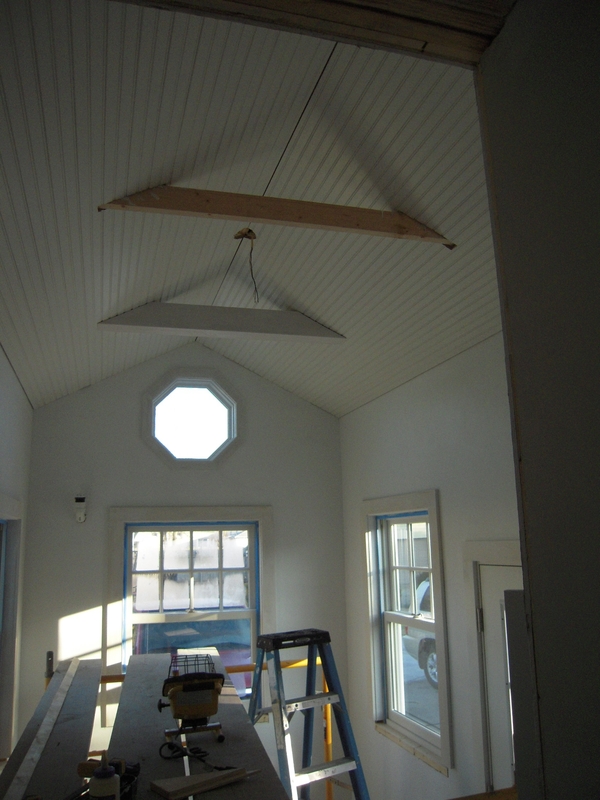 The center block with the wires is for the pendant lamp that will go there. 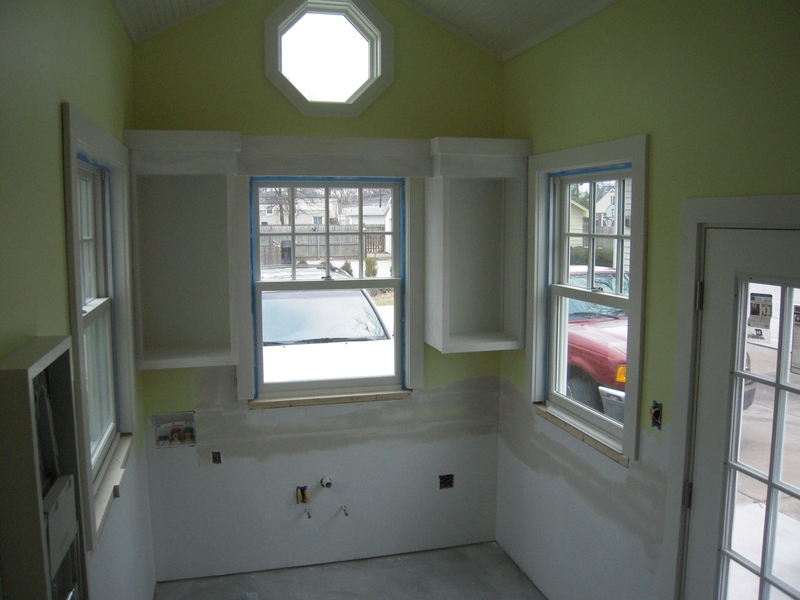 Drywall is being patched. 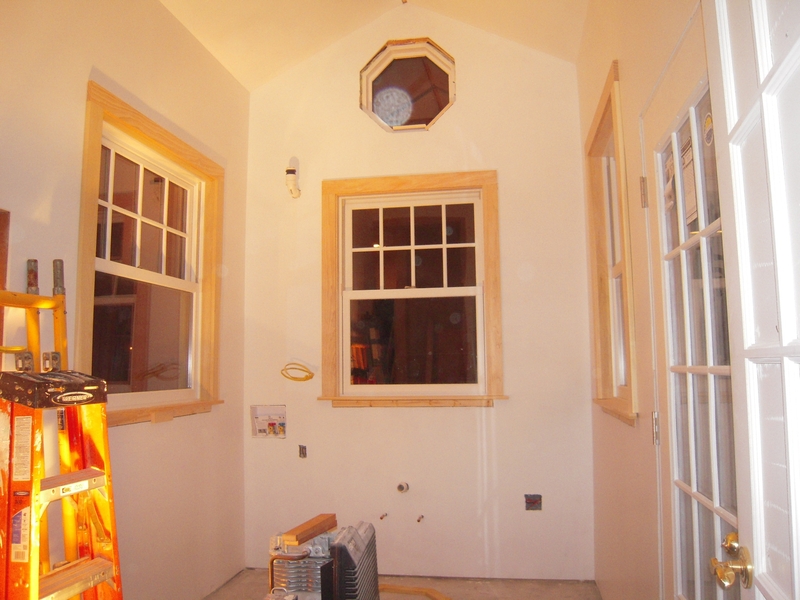 You can see the start of the light bridge that joins the two cabinets. I wanted something that made the back wall a cohesive element. 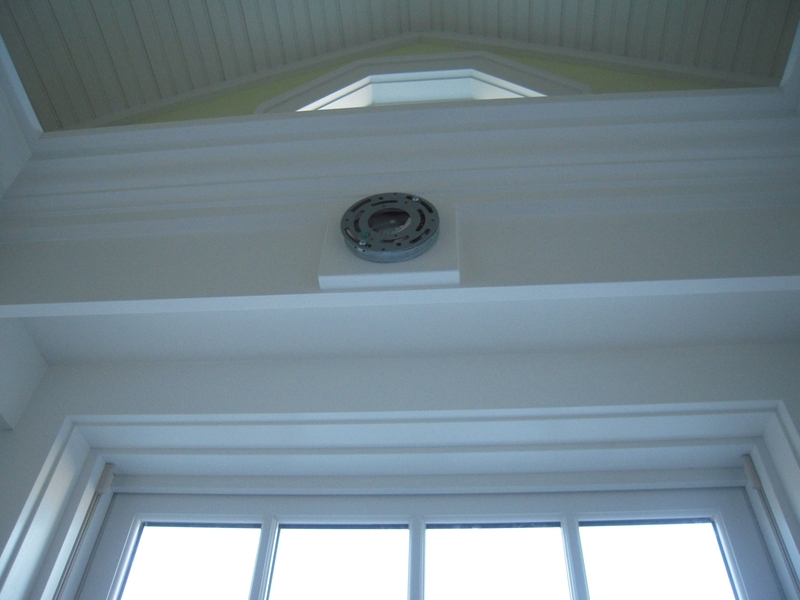 And see that the vent is now hidden behind the top molding base flat stock element. 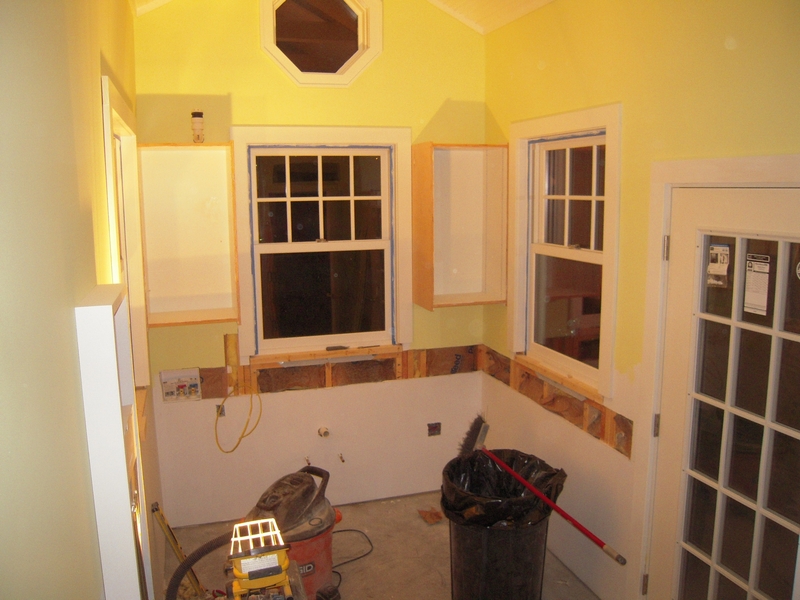 You can see the crown molding being added as well as the center block for the sink light. 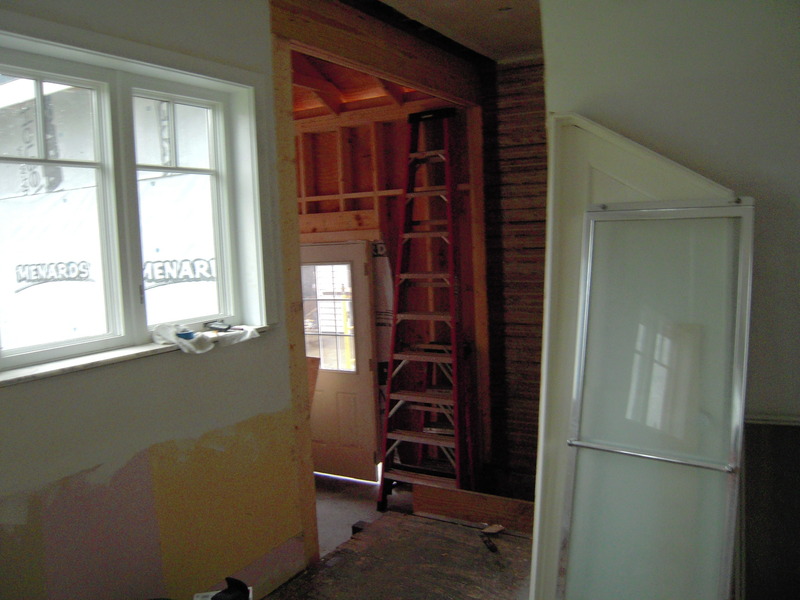 In the foreground you can see the start of the built in ironing center. My wife didn’t know what that thing was. 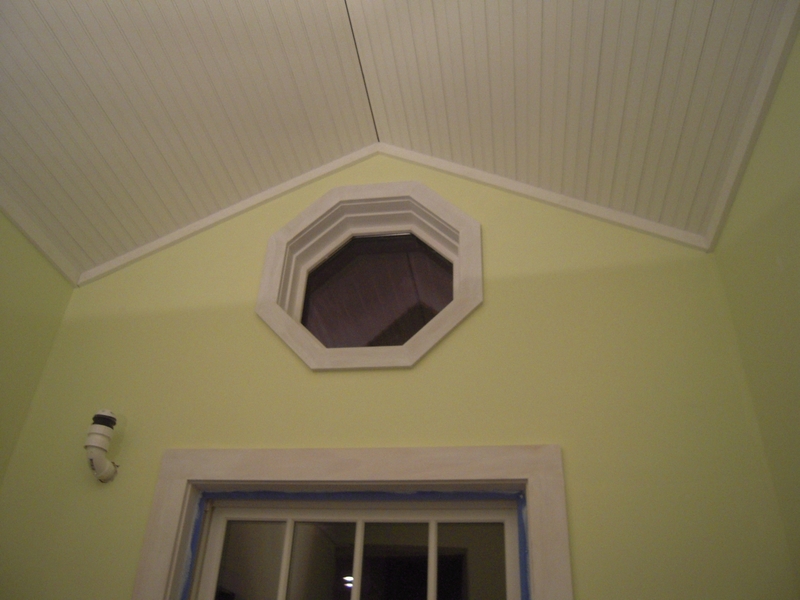 Here’s a closeup of the lighting block and molding details. No wires are visible to this light. 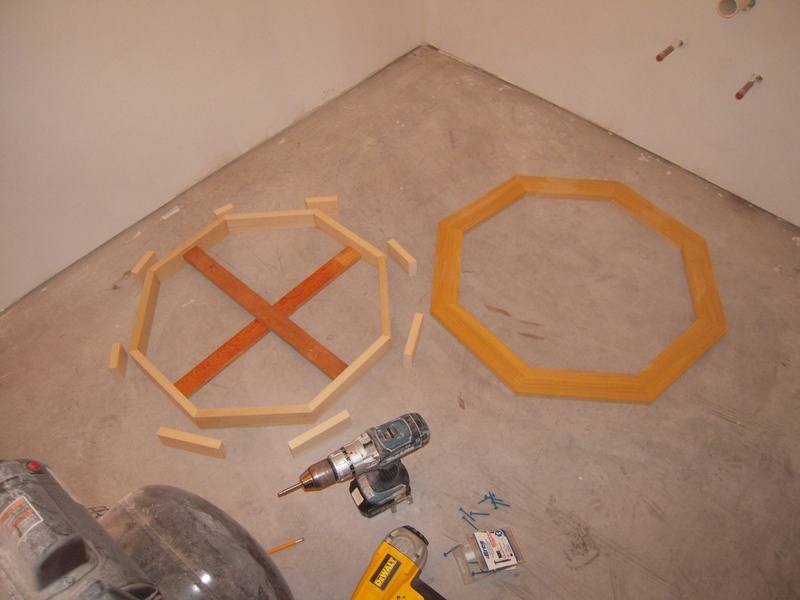 I built a chase to run the conduit between cabinet panels, so everything is covered. This is one of my favorite details in this room. 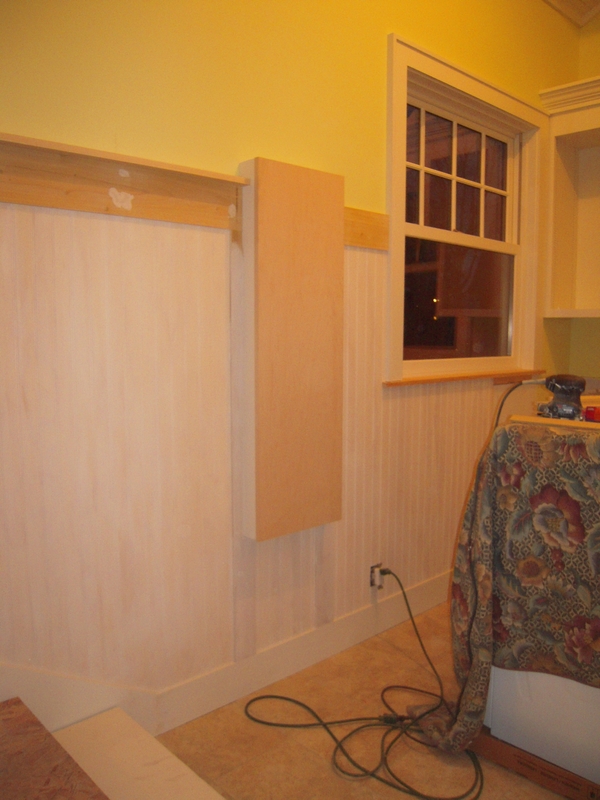 This shows the crown molding on the cabinets with the band stock that gives the tops of the cabinets some mass. It’s needed in a tall thin room like this. Here’s Francia pretending to be very tiny. Actually she’s standing (squatting) on the 1/4″ cork insulation that is recommended for in floor heat on concrete slab foundations. 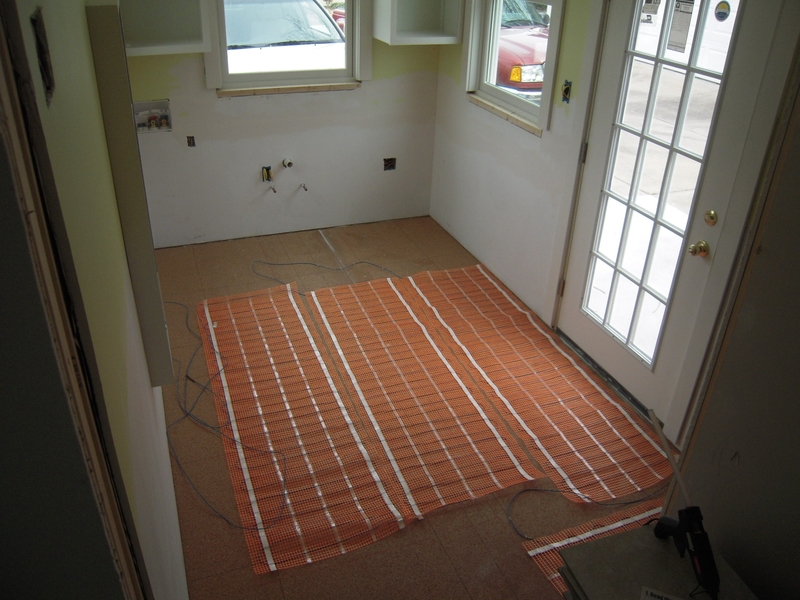 The Suntouch in floor heat is going down. 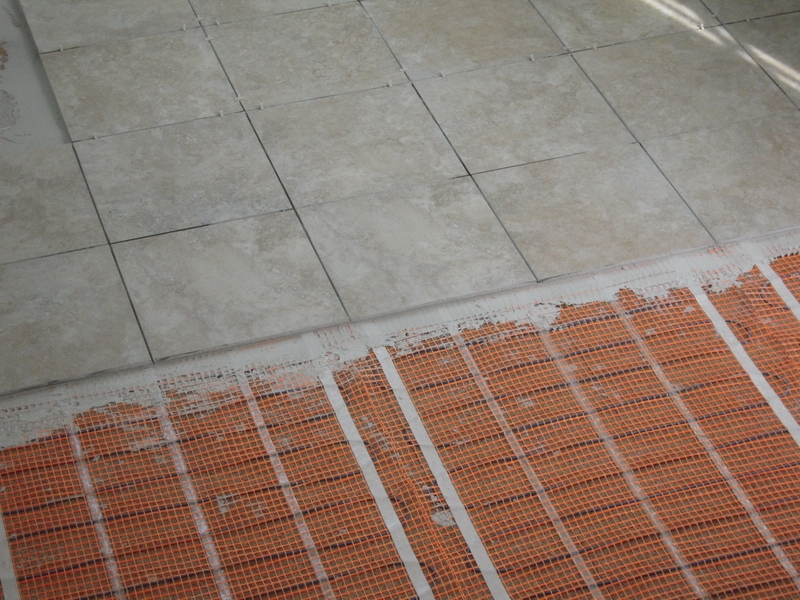 Same as used in the bathroom, it’s harder to install but has no emf radiation. 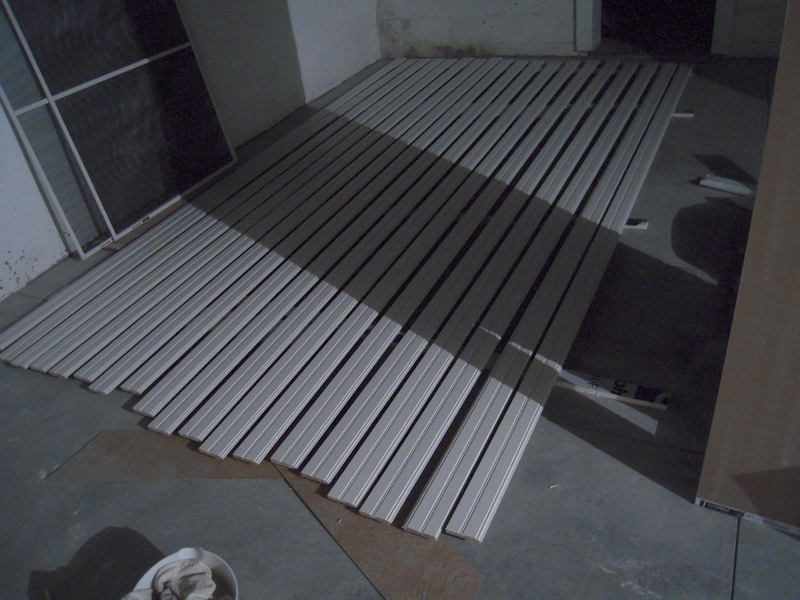 And now you see the start of my biggest mistake on this project so far. Stay tuned – I’ll tell you why in the next post. OK, so perhaps the above statement may be a little too strong on hyperbole. 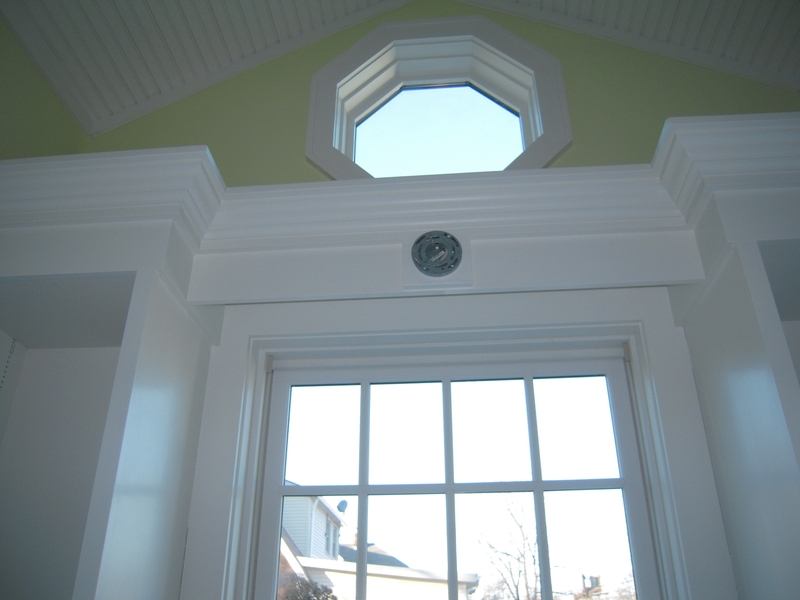 It’s actually the mudroom entrance. It was a design that evolved from one of those ‘what if we did…” kinda moments. 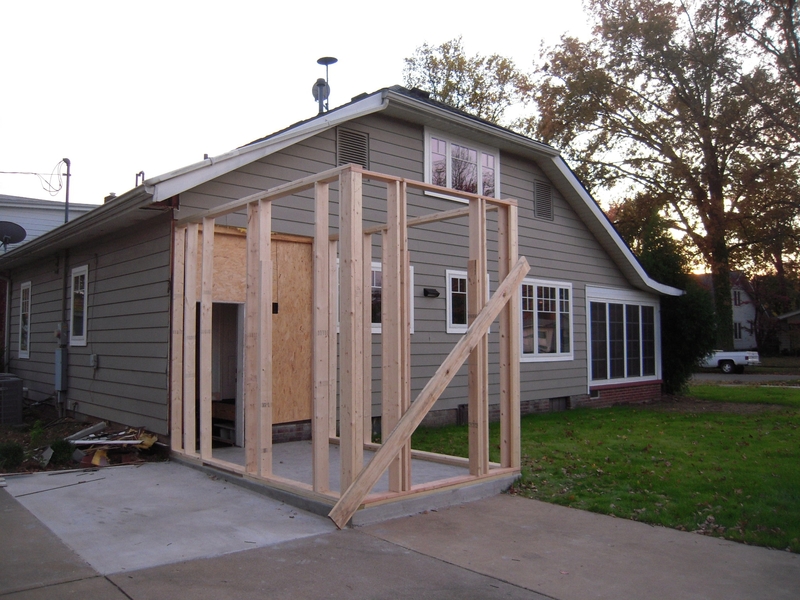 I thought I would take a break from the foundation drama of the past few posts to get back to room addition #1. Here’s where we left off. The back entrance. 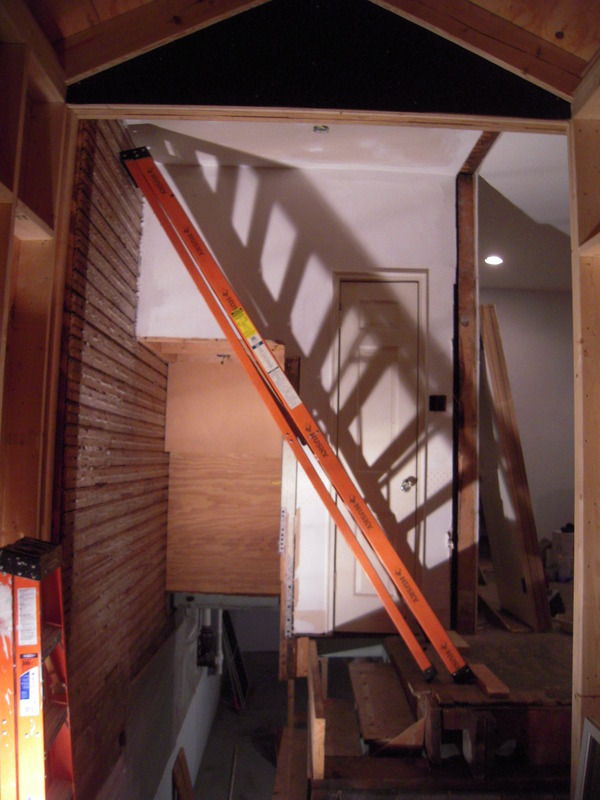 The original plan was to make a small entrance to allow the removal of the stair landing to the basement. It would create two paths – one you would enter and go down stairs to the basement – the other you entered and went up a couple of stairs to the kitchen. 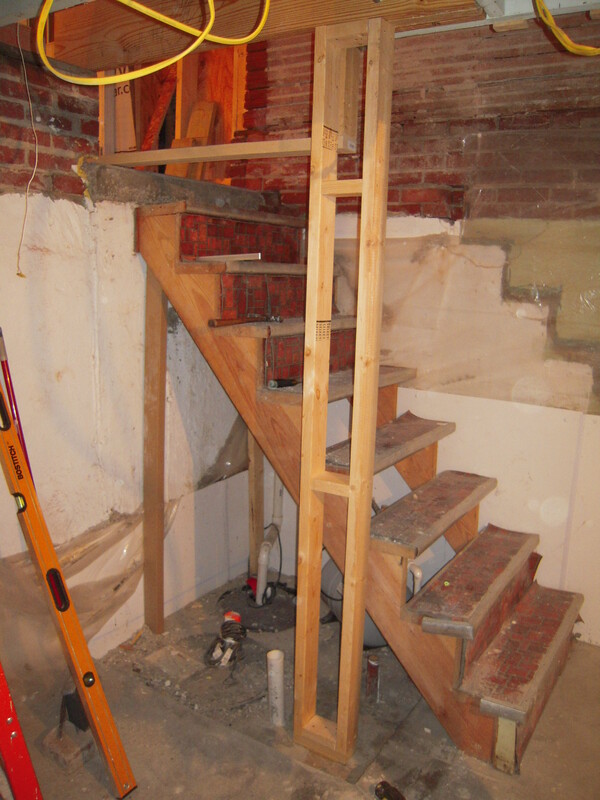 This would allow for adding the now ex-landing to the horizontal length of the basement stairs – which as illustrated in an earlier post were extremely steep and narrow. This is getting confusing with words. I’ll illustrate – but it might take a few posts to make it not so confusing. 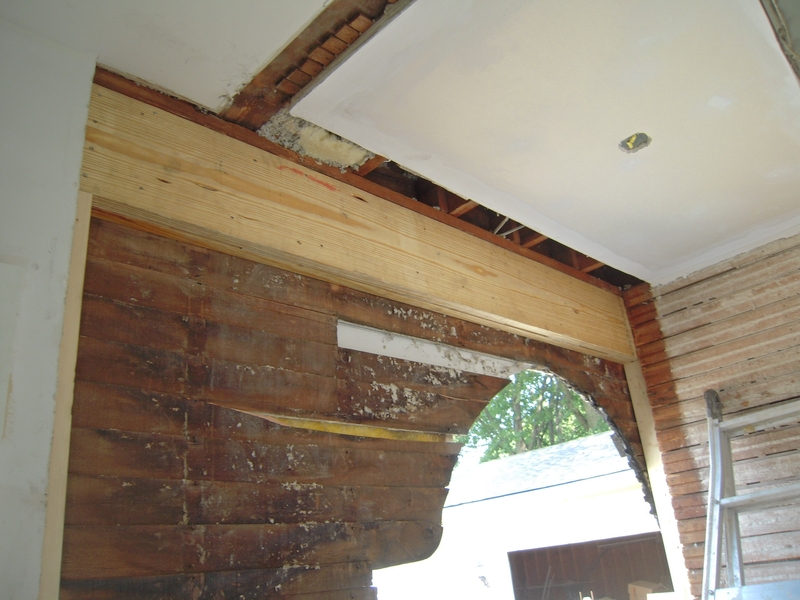 Here is the start of the demo – this poor canopy was patched and re-patched, and it still leaked into the side wall. 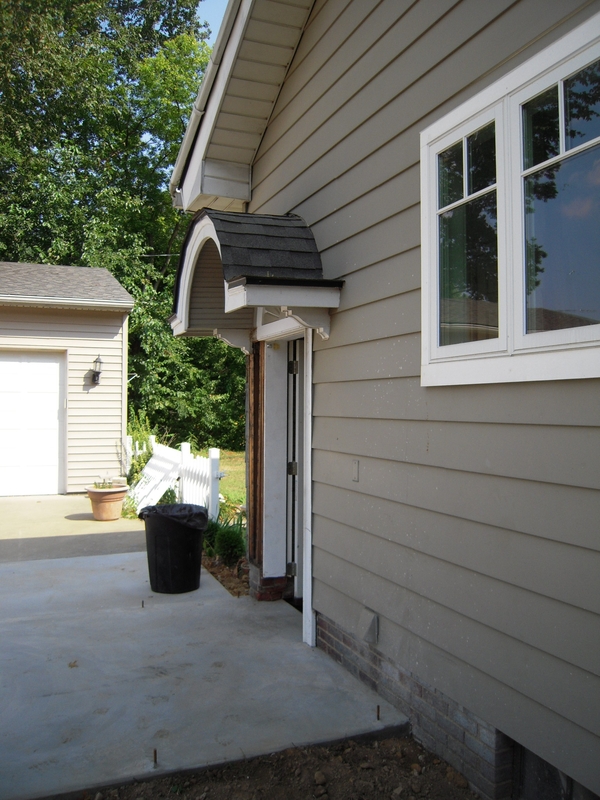 The reason is simple, caulk will not do a job designed for flashing. This view illustrates the game plan. The wall will be opened up to the right hand edge of the new slab foundation. 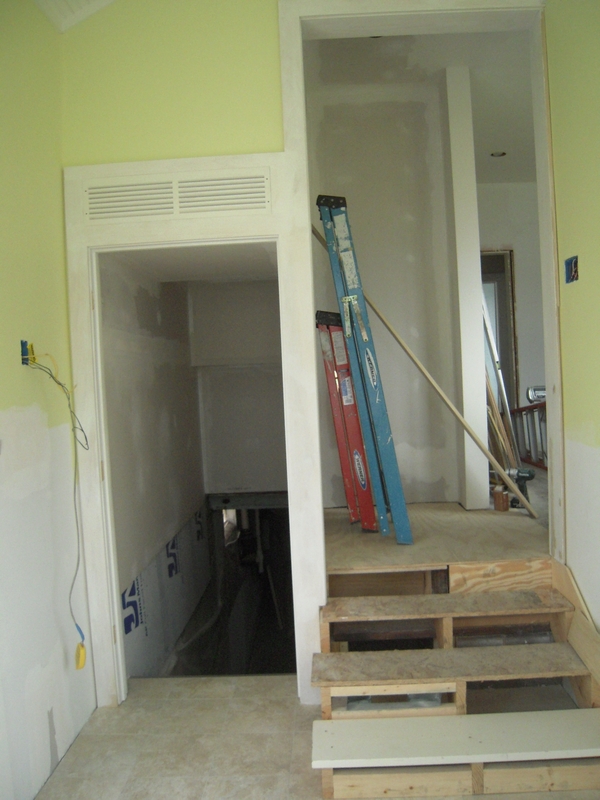 You can see where the existing back door stair landing was located and the steps to the right that went up to the kitchen. 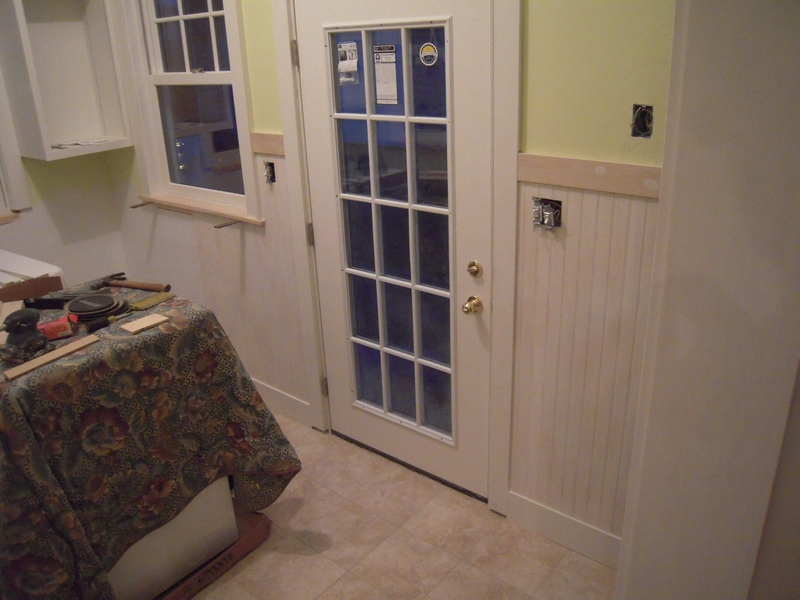 The other side of that small white door is the back of the new bathroom shower. 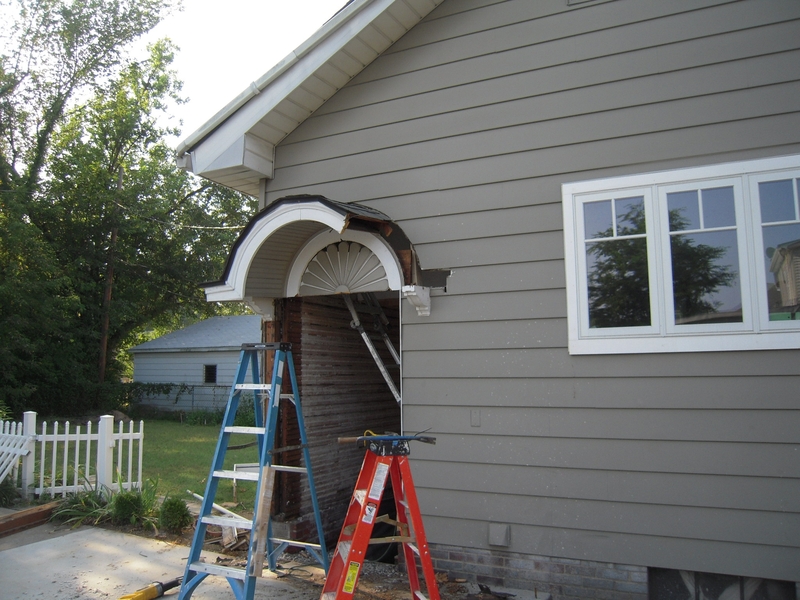 To make this happen I needed to install a double 2X12 header over the entrance. Luckily neighbor John saw me struggling and came over to help me get this beast up where it belonged. 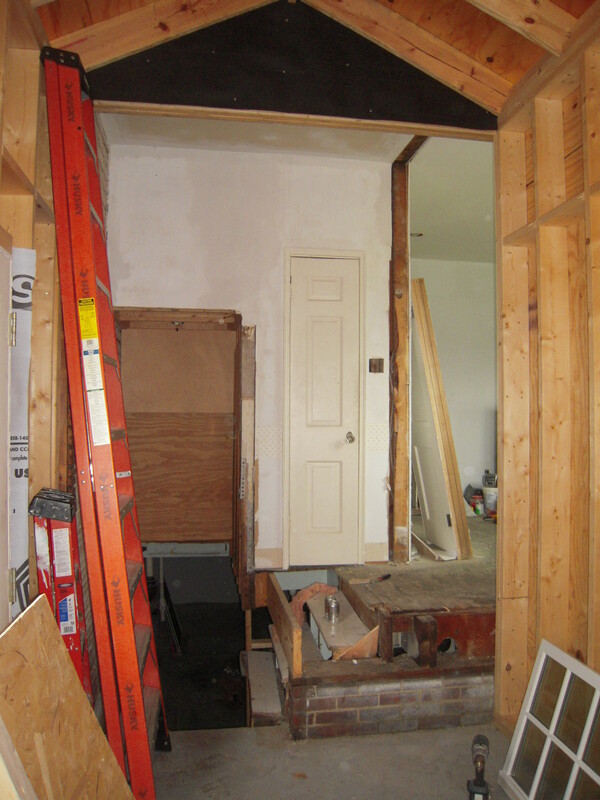 What’s not shown is the support wall that was needed to keep the load bearing wall from collapsing until this element could be placed. 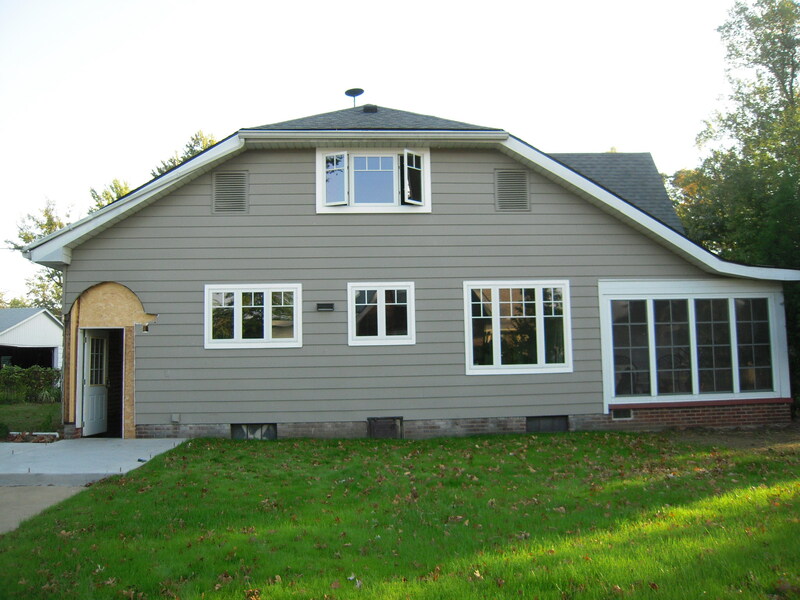 One other note: This house is constructed with the interior surface of the exterior walls sheathed with 3/4″ tongue & grooved wood – then plaster over that. 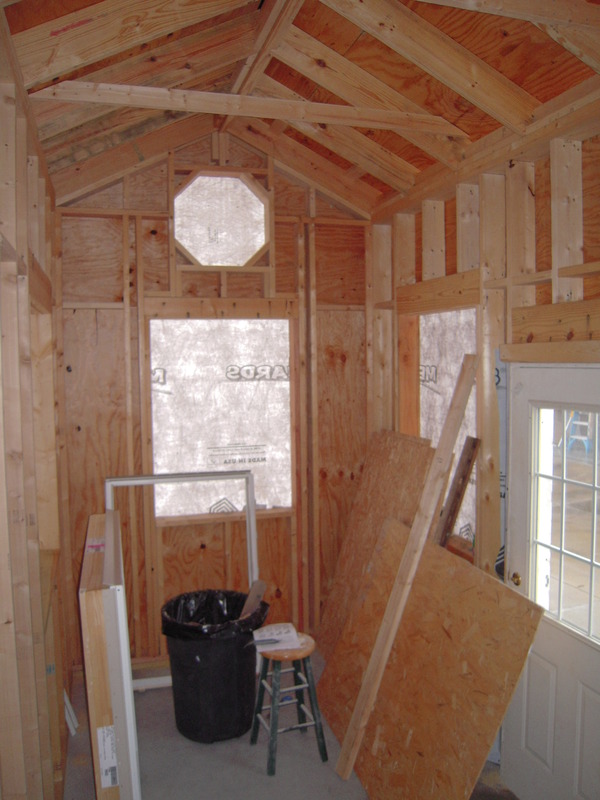 The exterior has no sheathing – just clapboards and that’s it – and lots of blown-in insulation. 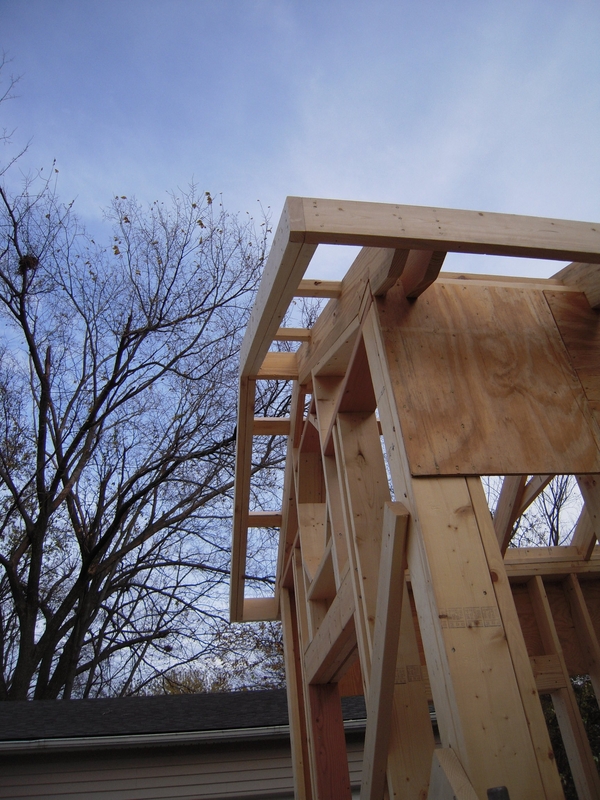 More on the sheathing in a latter post. A side view. 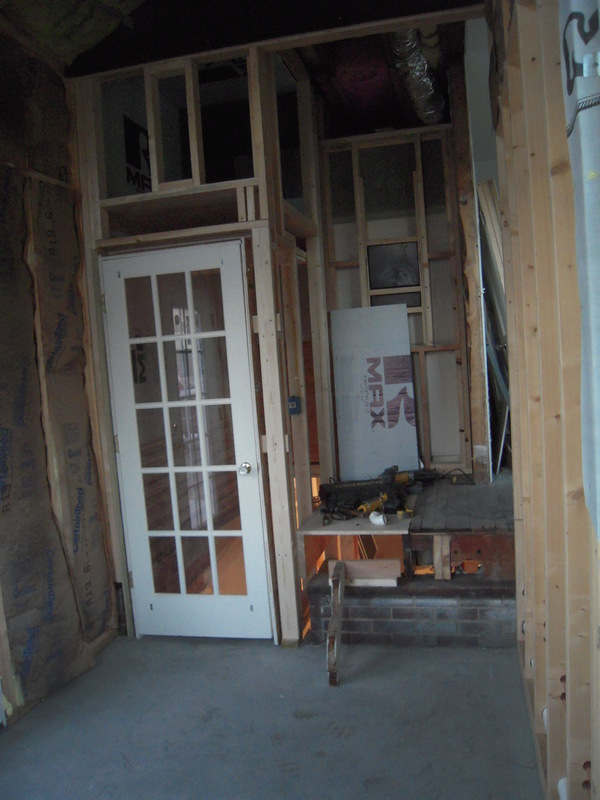 Originally this was to be a very small vestibule. 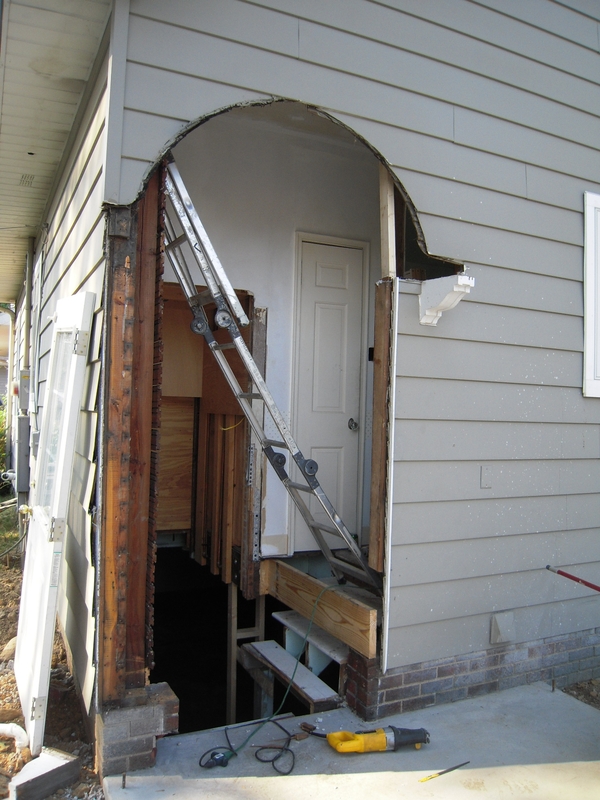 7′ wide and 4′ deep, just enough space to remove the stair landing. 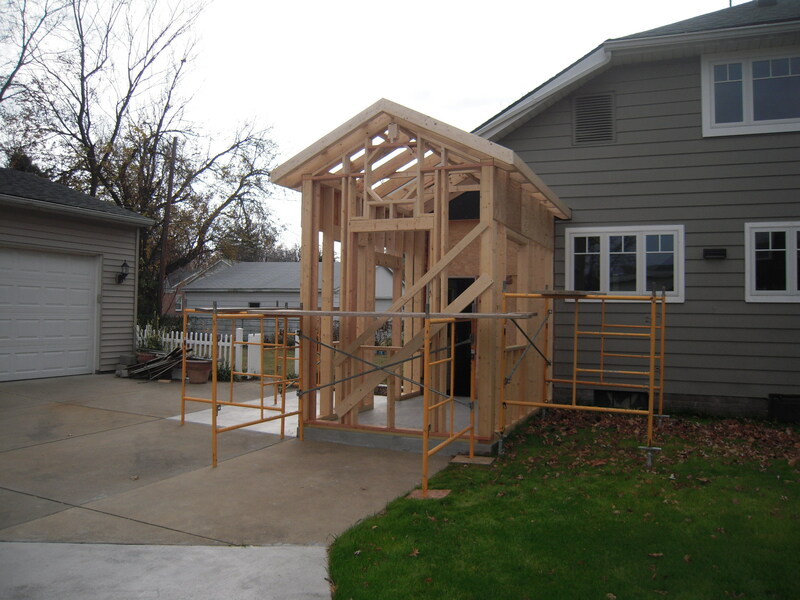 Think of this procedure this way – take the inside stair landing outside and build a little shed around it. 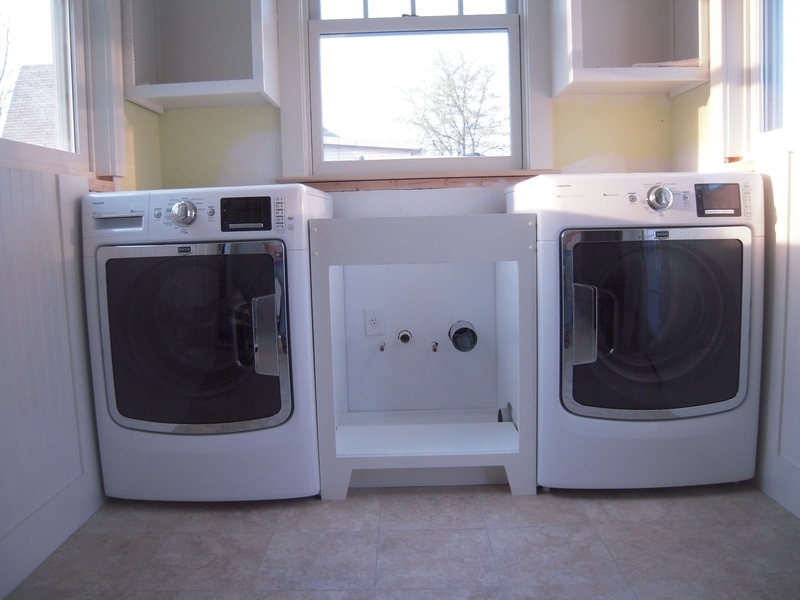 But I had one of those freestylin’ design moments and thought this would be a nice place for the washer and dryer as well. 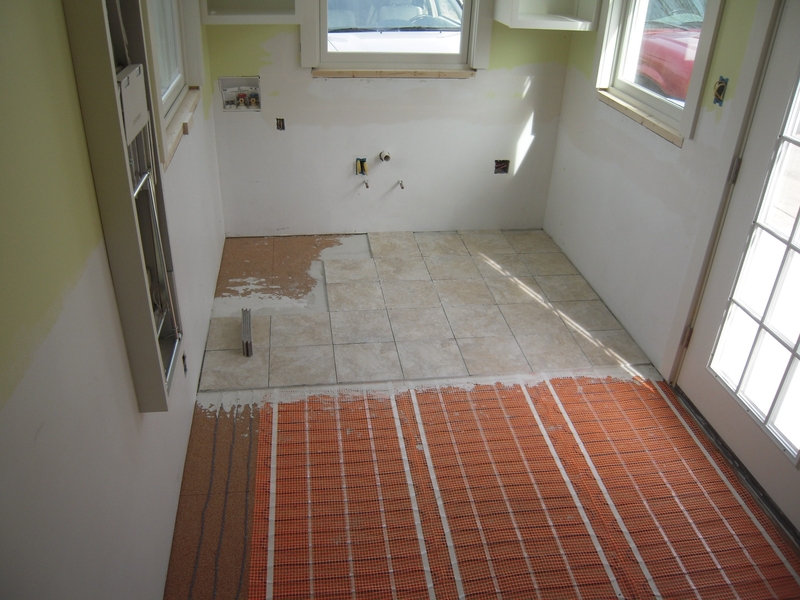 I roughed in the plumbing in the basement for this, but I thought this might be much more convenient. And Francia agreed. 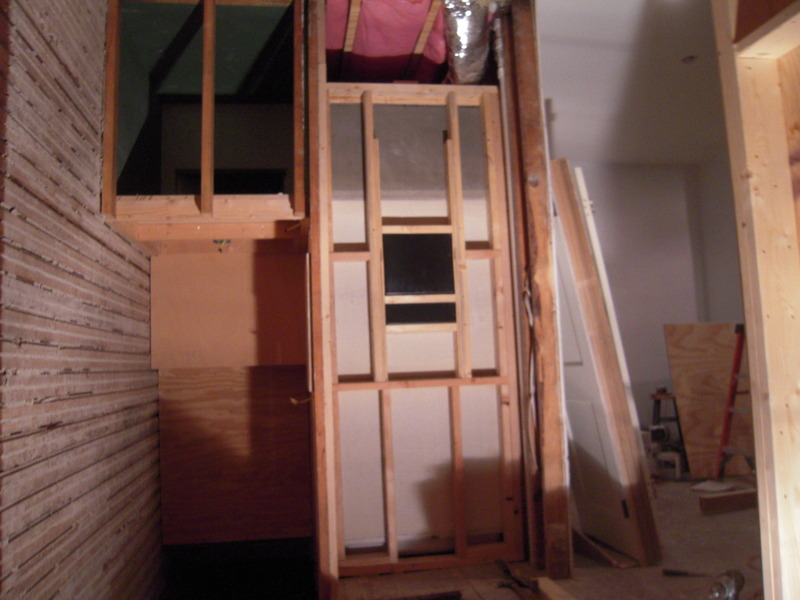 So the little room grew from 7′ wide and 4′ deep to 7′ wide and 12 1/2″ deep. 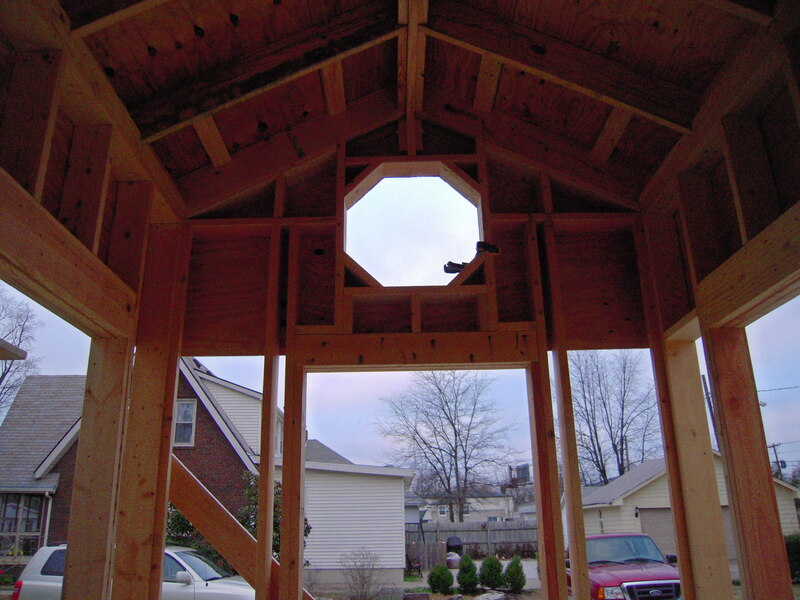 Here you can see some of the framing details. 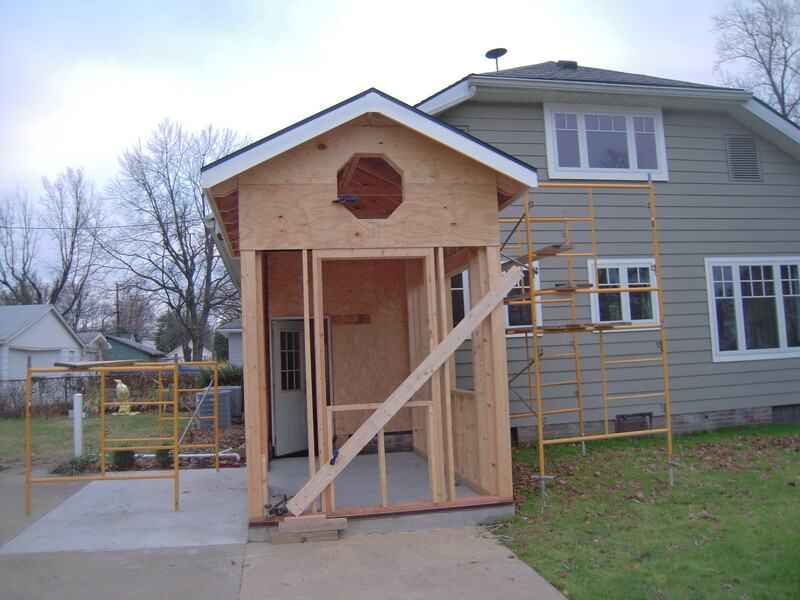 No matter how it comes out – one thing I want to make sure is that proper building techniques are used. 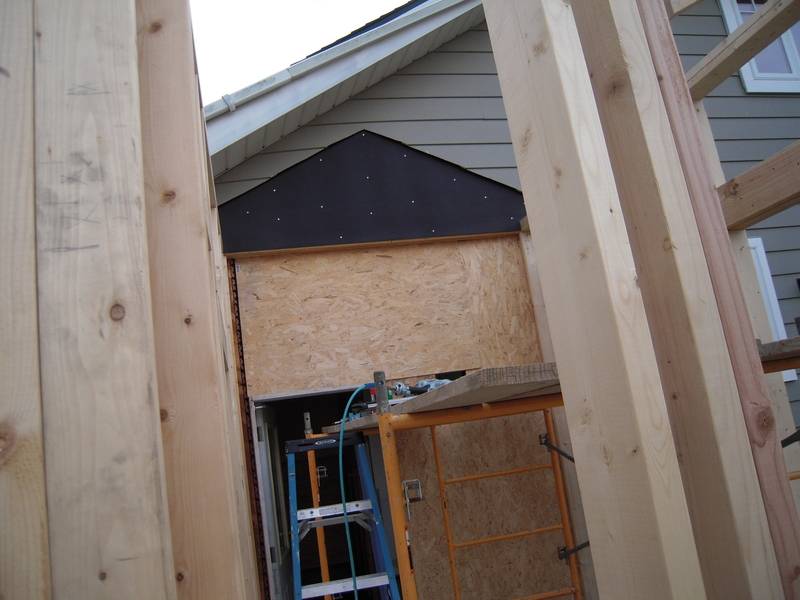 Here you see tar paper that covers the 1/2″ ply backing that abuts the house side. 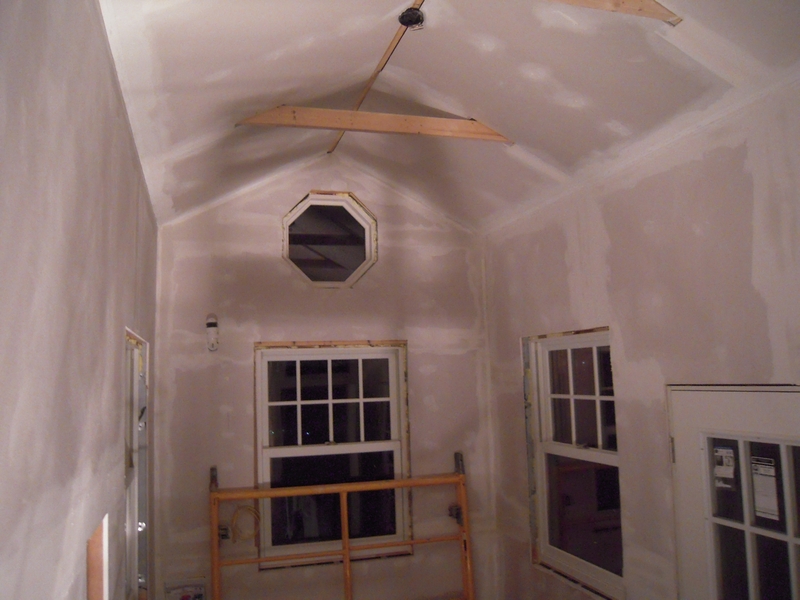 A pair of roof rafters will be attached here, so we need to make sure we make this area as watertight as possible. Flashing will go over this when we re-side the house. 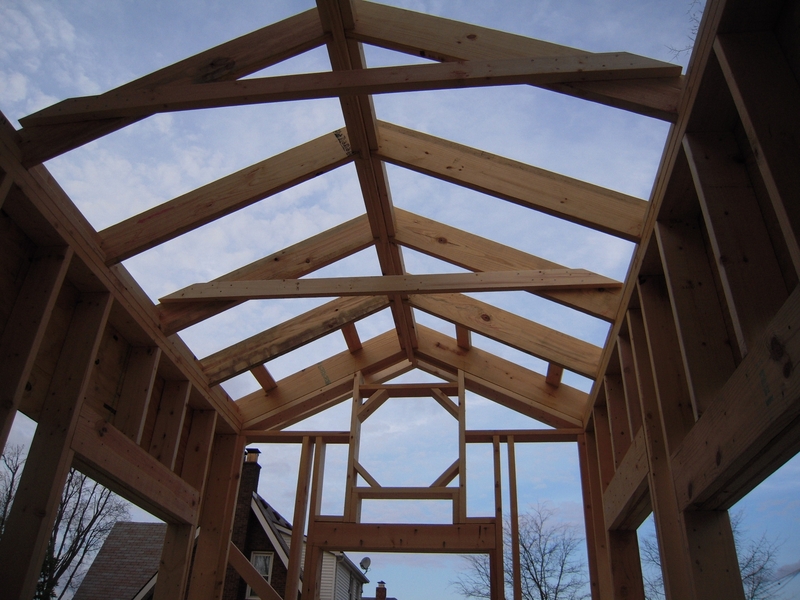 Here you see the roof framing and details. 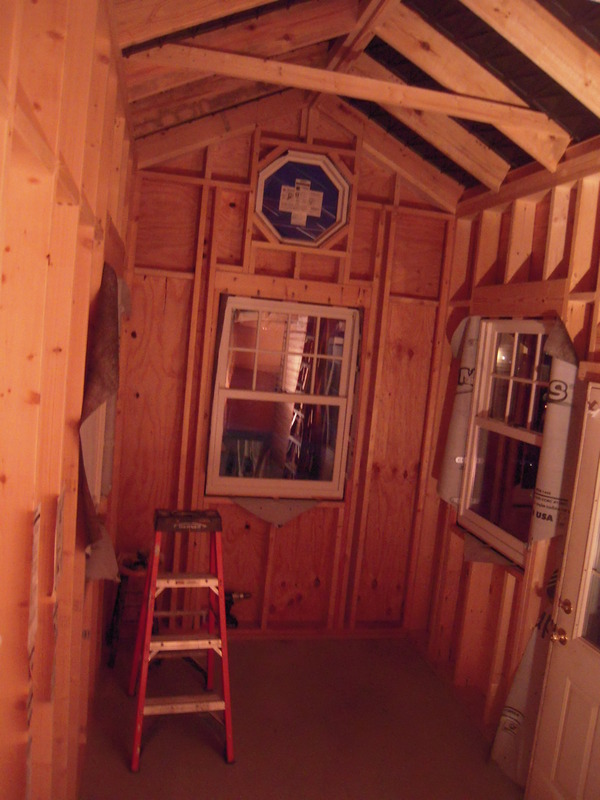 The rafters are cut 6/12 pitch and you can see the wall framing for a 2 foot octagonal window. 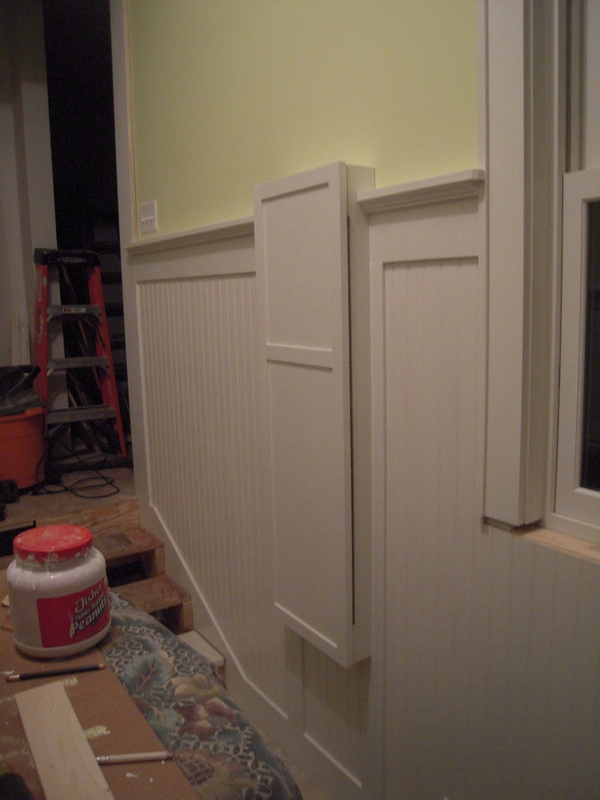 I just love making my interior trim more complicated. Here is a shot of the fly rafters. Those are the ones that hang over the front. This is called the “rake”. These are attached to outriggers that are attached to the side of the fly rafter and then get notched into the tops of the roof rafters. Did you follow that? 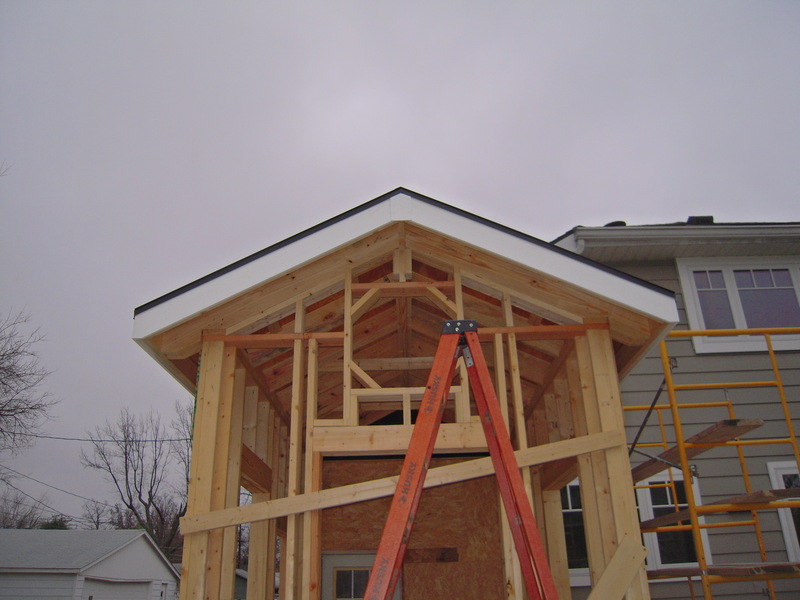 This makes a very strong roof structure. The flat elements that are parallel to the ground are the ‘eaves’. 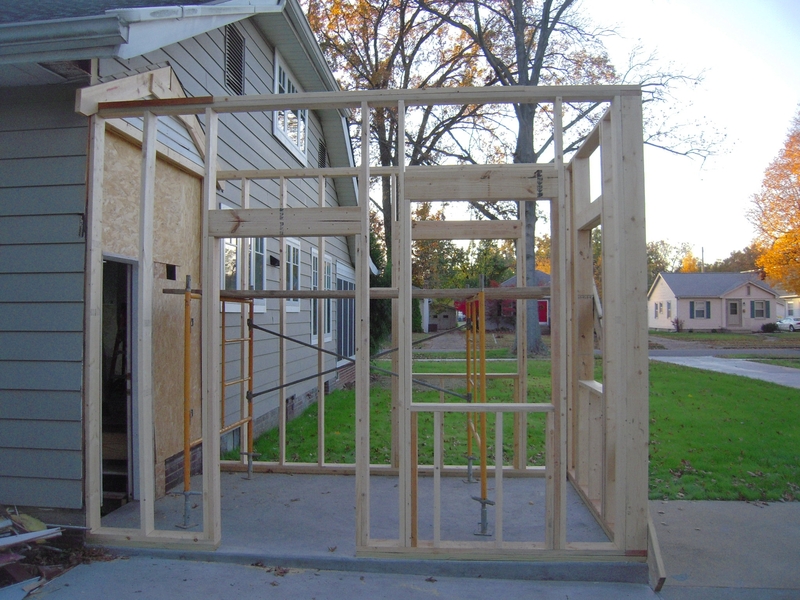 So here is the framing finished and ready for sheathing. 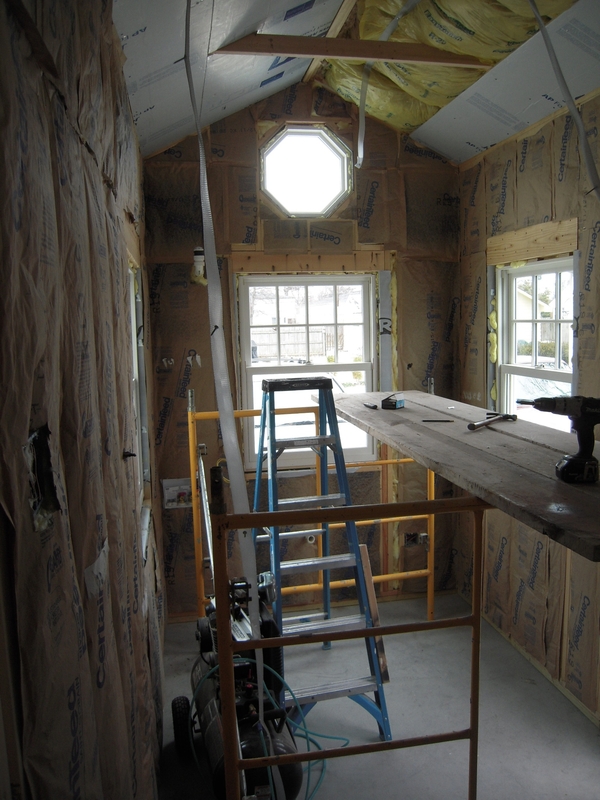 A 7′ wide room? This will be a challenge to design. 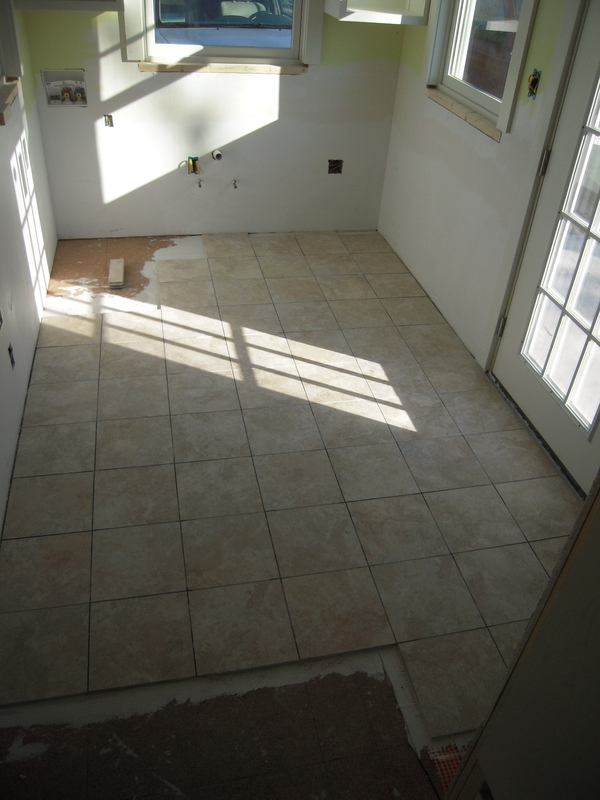 The kitchen floor level is 22″ from the mudroom floor. 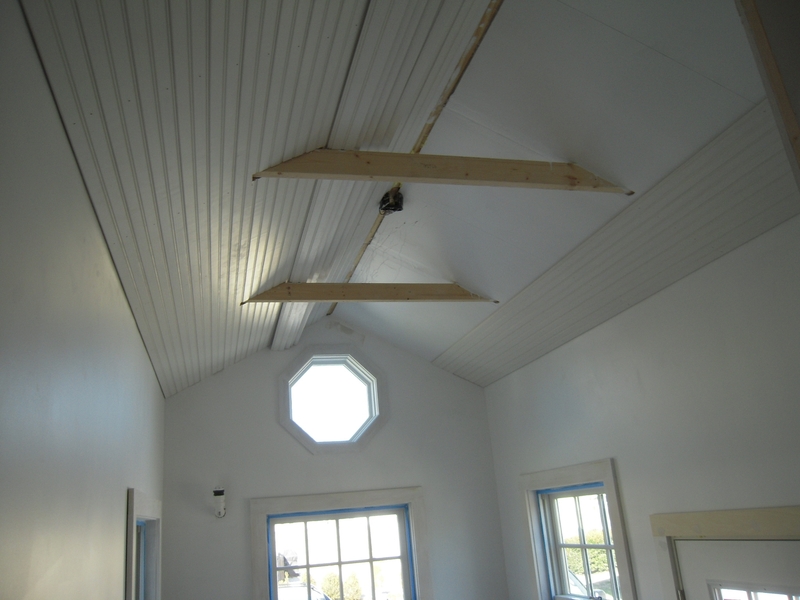 The ceilings are 9′ in the kitchen. 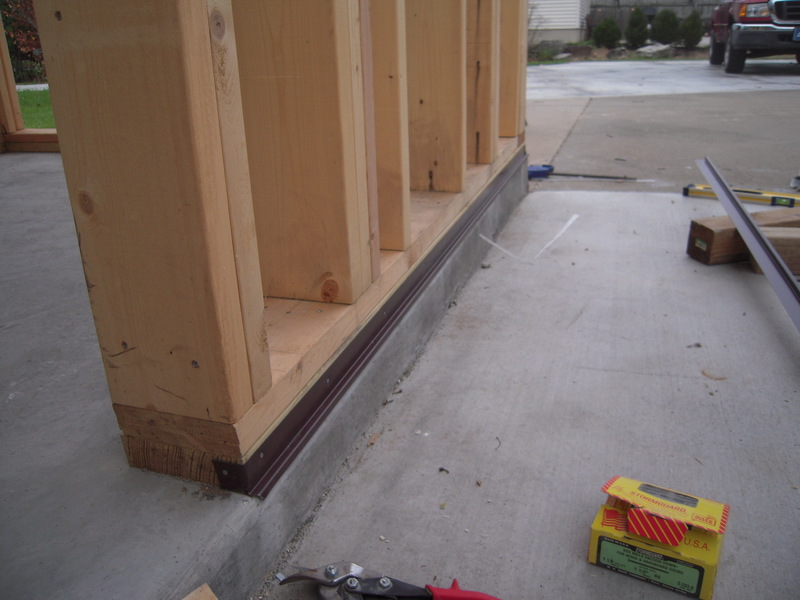 The existing roof overhang is 7/12 pitch and how am I gonna make this thing work and not look stupid? Well, we’ll see what comes of this.